Yeo (middle) presenting the FTTS certificate to a representative of one of the accredited premises. KOTA KINABALU: The Kota Kinabalu City Hall (DBKK) presented five business premises with the Fair Trade Tourism Select – An Accredited Outlet (FTTS) certificate yesterday. 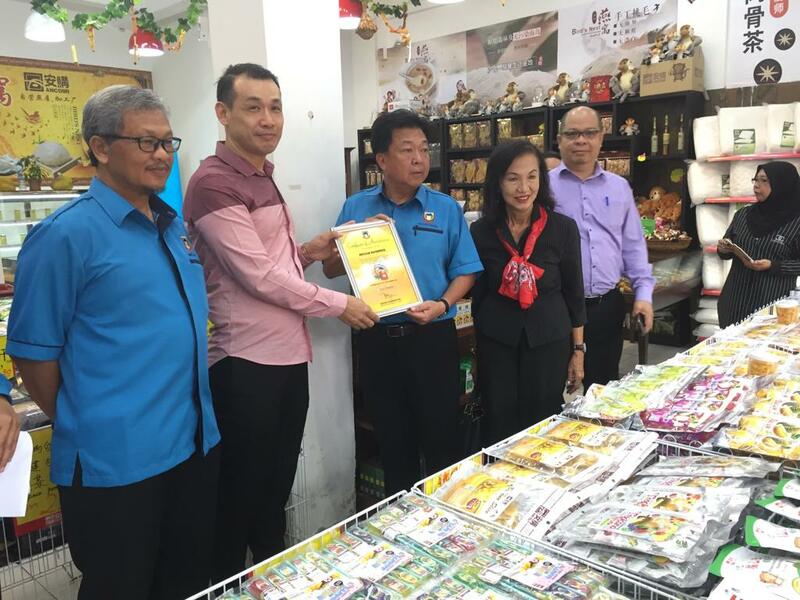 Mayor Datuk Yeo Boon Hai presented the certificate to Ancour Enterprise, Tempurung Cafe, Green Mug Cheese Cafe, Kueh-Kueh My and October Coffee for fulfilling City Hall’s quality and criteria standard. The FTTS is an initiative under the City Hall’s Tourism, Culture and International Relations Committee, which is under the portfolio of City Hall Advisory Board member Datuk Nancy Ho. The FTTS serves as a scheme to evaluate the service performance and tourism product quality of the premises in the city. It acknowledges business enterprises and tourism services that emphasise on fair economic principles, top-quality community development and environmental principles. Premises such as handicraft and souvenir shops; restaurants, eateries, kopitiam and cafe; accommodation services; and reflexology and spa services will be prioritized by City Hall. The FTTS is also supported by the Ministry of Tourism, Culture and Environment. It is understood that the FTTS accreditation will be valid for two years. Accredited premises will receive a certificate as well as an exclusive sticker that can be displayed on their doors. These selected premises will also have the privilege of gaining publicity through print and electronic media.